Posted January 21, 2015 by Road Junky. 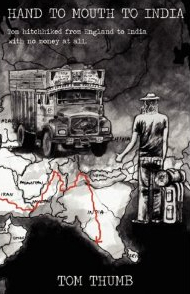 When I was 20 I hitchhiked to England to India with no money. I passed through England, France, Luxemboug, Germany, Austria, Hungary, Romania, Bulgaria, Turkey, Iran, Pakistan and then up through the Himalayas and down to Goa in a rite of passage that left me a very changed person. Sign up to receive the book below or just buy the paper book from Amazon! Sign up to get the book in your email!